Elicenseplateframes ventured with No-Refresh for the sake of offering cordial and user-friendly online license plate designer tool to its customers. 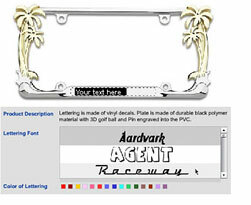 This online designing program proved to be ideal for them to create supreme quality license plate frames. The license plate design software is endowed with superb design solutions at the same time it comprehends the business requisites. It allows their users to create personalized vinyl license plate frames. Making appropriate use of license plate design software application, they can embed their aspired designs and patterns. It also enables them to reach to the peak of success by furnishing them with the customization facility letting their end users edit their designs. "It was not the No-Refresh reputation that encouraged us to sign up with them. But, it was their sizable team of designers and developers as well as their expertise that pushed us to start-up our business with them. They made a great contribution in our success. " Elicenseplateframes.com was founded in 2002 offering high quality products such as license plate frames. It is perfect online platform for purchase of license plate frames with the high-speed ease of the Internet. ElicensePlateFrames.com takes privacy very seriously. Here, a user can create highly customizable and personalized vinyl license plate frames such as designer license plate frames, customizable license plate frames, animal and insect license plate frames, sports license plate frames, funny license plate frames, auto make and model license plate frames, inspirational license plate frames, profession or work related license plate frames, silk screen license plate frames, motorcycle license plate frames and lots more. Elicenseplateframes.com had a requirement of an easy-to-use custom online license plate designer software by which user can customize high quality license plate frames with own text. The company needed a tool that can provide its customers the ability to design license plate frames online with great user experience on the web. Elicenseplateframes.com requested No-Refresh to take charge of development of online custom online license plate designer software for the company in consideration of designing License Plates and License Plate Frames. The firm was specific with some of its requirement related to tool. Elicenseplateframes.com choose No-Refresh as its partner for the development of online custom online license plate designer software. The highly skilled and professional team of No-Refresh brings in world-class consulting skills, superb project execution capabilities, and a high degree of reliability along with technological excellence to the company. The feature-rich tool developed by No-Refresh team adds the strength to their website. Teaming with No-Refresh has enabled E-license Plate Frames to give new competitive edges to the website. The company business requires Elicenseplateframes.com to be agile as a global service provider in a fast-moving, innovation-driven industry and an online custom license plate designer application has helped them significantly in their business growth. This tool provided the company a good insight into the market opportunities. Using this Custom License Plate Design Tool, website users can create full-color unique custom license plate online by adding graphics, text, and various specialty effects.